Eccrine syringofibroadenoma is a rare, benign adnexal lesion derived from cells of the acrosyringium of eccrine sweat glands. This lesion has multiple clinical manifestations, including a reactive form, occurring in a pre-existing inflammatory or neoplastic dermatosis. Our case represents the typical presentation of the reactive form of eccrine syringofibroadenoma, including the dermoscopic appearance of the lesion. Pedal dermatological disorders are commonly limited to superficial fungal, viral and bacterial infections, pressure induced and genetic hyperkeratotic disorders, psoriasis and eczemas. Pedal neoplastic disease is much less common. There is a characteristic diagnostic delay of pedal neoplasms that can be attributed to the behavior of both patients and physicians. Patients may pay less attention to lower extremity problems, while in the primary care office the lower extremity physical examination may have a low priority. Physicians must also be aware of this complication of chronic dermatosis. 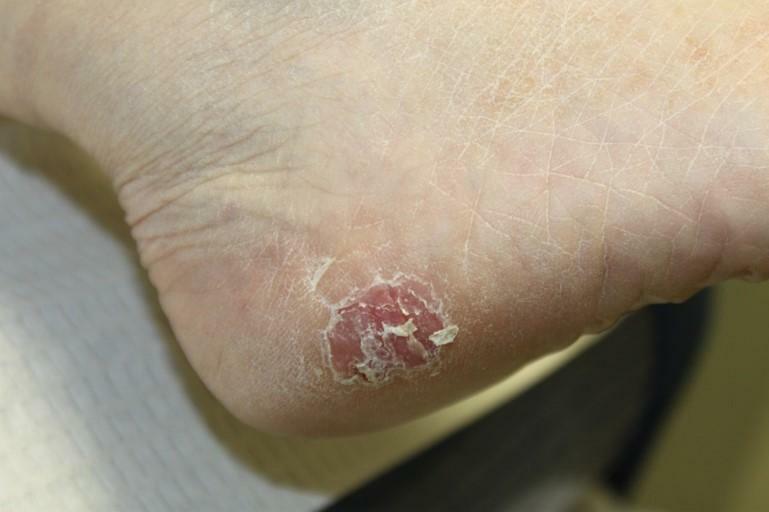 A 62-year-old female presented with a 12-year history of intermittent nummular eczema on the right heel. Treatment with triamcinolone 0.5% ointment had provided some relief (patient stated 20% improvement) but the lesion remained. The patient wanted to know the diagnosis and accepted the risks and benefits of a punch biopsy. The medical history was significant for epilepsy, treated with Dilantin. Physical examination demonstrated an erythematous hyperkeratotic plaque with fissures on the right heel measuring 1.5 cm. in diameter (Figure 1). Dermoscopy examination with polarized light revealed enlarged irregular dermal vascular structures and opaque hyperkeratosis consistent with cutaneous neoplasia (Figure 2). A 2-mm punch biopsy was performed and the specimen was sent for analysis. The pathology diagnosis was reported as syringofibroadenoma. The patient was referred for a possible wide excision of the lesion. Figure 1 Scaly plaque over lateral aspect of the right heel pad. Figure 2 Dermoscopy image with polarized light detects glomerular dermal vessels partially obscured by opaque hyperkeratosis. Figure 3 Thin anastomosing cords of epithelial cells surrounded by fibrovascular stroma (H&E x 10). Eccrine syringofibroadenoma (ESFA) is a rare, benign neoplasm of the acrosyringium of eccrine sweat glands, first described by Mascaro in 1963 . ESFA has multiple clinical presentations. These were classified by Starink into four subtypes . French added a fifth subtype, reactive . The current classification system is: 1) solitary ESFA, non-hereditary, 2) multiple ESFA in hidrotic ectodermal dysplasia (Schöpf syndrome), 3) multiple ESFA without cutaneous findings (eccrine syringofibroadenomatosis), 4) nonfamilial unilateral linear ESFA (nevoid), and 5) reactive ESFA associated with inflammatory or neoplastic dermatoses . This lesion typically presents in adult individuals, usually over the age of 40. It frequently appears in the distal extremities. The reactive form is present in patients with inflammatory or neoplastic lesions, or in patients with peripheral neuropathy . In these cases, eccrine syringofibroadenoma may arise in response to repetitive damage with subsequent repair of eccrine ducts . The exact nature of the lesion, however, is not completely understood. It may be hyperplastic, hamartomatous, or neoplastic. 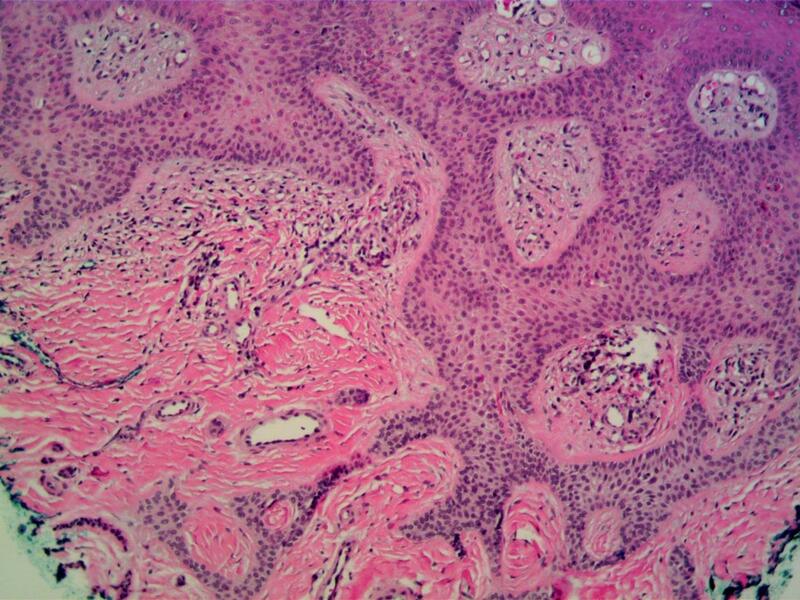 Although ESFA typically has a benign course, it has been reported as a precursor to squamous cell carcinoma and pseudocarcinomatous hyperplasia [5, 6]. Malignant transformation of ESFA is rare, but has also been reported . In these cases, it can be difficult to determine if the EFSA was the primary lesion, with a carcinoma developing within it, or if the EFSA developed in response to a previously existing cancer. Clinically, ESFA presents as a slow growing, exophytic lesion with a verrucous or spongy, moist mosaic, or erythematous scaly plaque appearance . The lesions may be solitary or multiple. It is frequently located on the extremities, with multiple case reports involving the foot and ankle, although other parts of the body such as the hand, wrist, finger, and lip, can be involved . The dermoscopy image detected vascular structures consistent with glomerular vessels. The structural pattern of vessels in dermoscopy play a critical role in the diagnosis of non-pigmented skin lesions . Glomerular vessels are large-caliber reddish dots formed by tortuous capillaries curled up into a ball, resembling the glomerular apparatus of the kidneys and have been observed in a variety of neoplasms including Bowen’s disease, eccrine poroma, basal cell carcinoma, Merkel cell carcinoma as well as actinic keratoses and stasis dermatitis but have not been previously reported in ESFA . The histologic appearance of the lesion demonstrates thin, anastomosing strands of epithelial cells, which can appear as cords, surrounded by a fibrovascular stroma. These strands are contiguous with the epidermis . Eccrine syringofibroadenoma stains positive with epithelial membrane antigen and carcinoembryonic antigen. In spite of the highly variable clinical presentation, the histologic appearance of ESFA is uniform for the different subtypes . Differential diagnosis may include prurigo nodularis, granulomatous dermatitis, fungal and bacterial infections, eccrine poroma, reticulated seborrheic keratosis, lichen sclerosis, and fibroepithelioma of Pinkus and amelanotic melanoma [8, 9]. Our patient represented a case of reactive eccrine syringofibroadenoma. The patient had a 12-year history of intermittent nummular eczema on the right heel with only a partial response to topical steroids. This type of clinical history is similar to other reported cases of reactive EFSA. 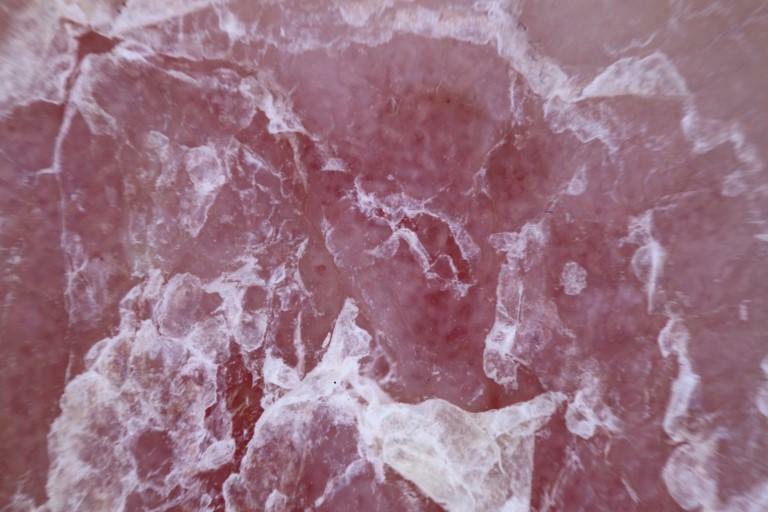 Histologically, the lesion demonstrated the typical appearance of EFSA, with thin anastomosing cords of epithelial cells surrounded by fibrovascular stroma contiguous with the epidermis. There were no signs of atypia or malignant transformation (Figure 3). Our patient was referred for wide excision of the lesion to a plastic surgeon and to a dermatologist for a full body examination to search for additional lesions. Wide excision has been the mainstay of treatment , although cryotherapy , radiation , and carbon dioxide laser  are alternatives. For early lesions, close observation and follow up may be an alternative to complete excision, especially if complete excision is difficult due to the size or location of the lesion . The patient was lost to follow-up. This case was written with the approval of the Kent State University Institutional Review Board. Mascaro JM. Considerations on fibro-epithelial tumors. Exocrine syringofibroadenoma. Ann Dermatol Syphiligr (Paris) 1963;90:143-53. Starink TM. Eccrine syringofibroadenoma: multiple lesions representing a new cutaneous marker of the Schöpf syndrome, and solitary nonhereditary tumors. J Am Acad Dermatol 1997;36(4):569-76. French LE. Reactive eccrine syringofibroadenoma: an emerging subtype. Dermatology 1997;195(4):309-10. Sirikham T, Rojhirunsakool S, Vachiramon V. Reactive Eccrine Syringofibroadenoma Associated with Neuropathy, Venous Stasis, and Diabetic Foot Ulcer. Case Rep Dermatol 2016;8(2):124-9. Bjarke T, Ternesten-Bratel A, Hedblad M, Rausing A. Carcinoma and eccrine syringofibroadenoma: a report of five cases. J Cutan Pathol 2003;30(6):382-92. Kacerovska D, Nemcova J, Michal M, Kazakov DV. Eccrine syringofibroadenoma associated with well-differentiated squamous cell carcinoma. Am J Dermatopathol 2008;30(6):572-4. Katane M, Akiyama M, Ohnishi T, Watanabe S, Matsuo I. Carcinomatous transformation of eccrine syringofibroadenoma. J Cutan Pathol 2003;30(3):211-4. Lowell DL, Salvo NL, Weily WJ, Swiatek M, Sahli H. Multiple Eccrine Syringofibroadenoma of Mascaro of the Lower Extremity. J Am Podiatr Med Assoc 2016;106(6):433-8. Tiwary AK, Firdous J, Mishra DK, Chaudhary SS. 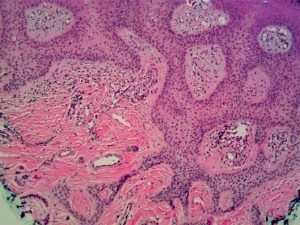 A case report of reactive solitary eccrine syringofibroadenoma. Indian Dermatol Online J 2017;8(1):35-8. Cho E, Lee JD, Cho SH. A case of reactive eccrine syringofibroadenoma. Ann Dermatol 2011;23(1):70-2. Ozkaya DB, Su O, Bahalı AG, Topukçu B, Dizman D, Tosuner Z, et al. Solitary Eccrine Syringofibroadenoma and Successful Treatment with Cryotherapy. J Am Podiatr Med Assoc 2016;106(3):237-8. Morganti AG, Martone FR, Macchia G, Carbone A, Massi G, De Ninno M, et al. Eccrine syringofibroadenoma radiation treatment of an unusual presentation. Dermatol Ther 2010;23 Suppl 1:S20-3. Athanasiadis GI, Bobos M, Pfab F, Athanasiou E, Athanasiadis IE. Eccrine syringofibroadenoma treated with carbon dioxide laser. Clin Exp Dermatol 2009;34(2):261-3.